The bedroom is probably one of the most sacred places in the home, as it is where we rejuvenate ourselves, and therefore it should be the one room where we spend more thought in the design process. 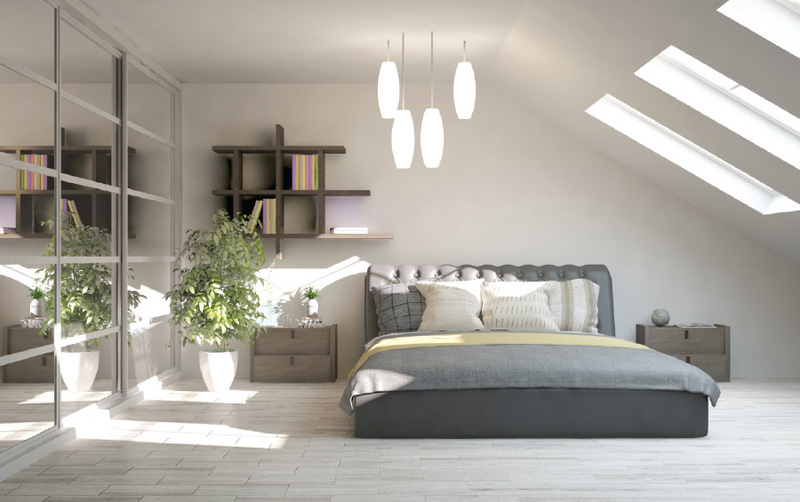 As there are so many ways to design the bedroom, there is no specific formula we can follow; however, we can look at difference examples to see what appeals to us and what we can try to avoid or implement. The first thing I want to explore are ceiling features such as chandeliers, fans and even sculptures. What features can we consider as acceptable, and does it make sense from a practical point of view? Personally, I tend to design with a modern, cleaner outlook, through hidden lights, table lamps and recessed spotlights. Here in this example, while this bedroom setup has all the elements required for a bedroom, the arrangement seems rather off. The feature wall is located to the side, and the chandelier looms directly overhead as if the setting was suited more for a dining room than for a bedroom. The next element we need to look at for this bedroom scenario is the arrangement of the furniture. First and foremost, avoid all mirrors in the bedroom. If this is unavoidable, consider building a cabinet feature to hide the mirror when not in use. The next is positioning of the bed. While the arrangement is somewhat accurate we need to look at the whole design as a totality. Try to create a more defined and feature-like effect for the headboard rather than a painted wall. The next is to avoid wall lights, and consider using a smaller reading lamp or recessed spotlights overhead instead. And finally, soften the feel of the room through the use of lighter coloured carpets or rugs to create a more homely effect. The use of headboards is a personal choice and is dependent on the bed frame and concept you want to achieve. There are many different ways to design the headboard, but generally I would try to avoid features such as duplication of materials. As a general rule, the bed is the “star” of the room so to speak, so every design element should be done to compliment it. Therefore, try not to overuse one element, as repetitive use would tend to overshadow the bed feature. In this example, the wall that backs the bed replicates the use of the timber floor planks, which then feels overwhelming. While we can use timber backing the headboard with a timber floor, try to change the material pattern to avoid this overly repetitive effect. 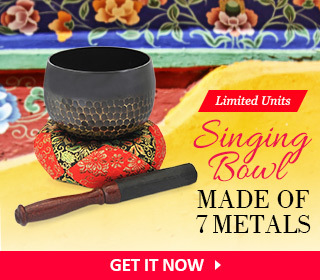 One of the things we need to understand is that everyone has a different expectation as to what they want for the bedroom. This is the subjective element of design. But it is the practical element that we should all try to adopt. In this example, all the key features are present to make this a comfortable bedroom. 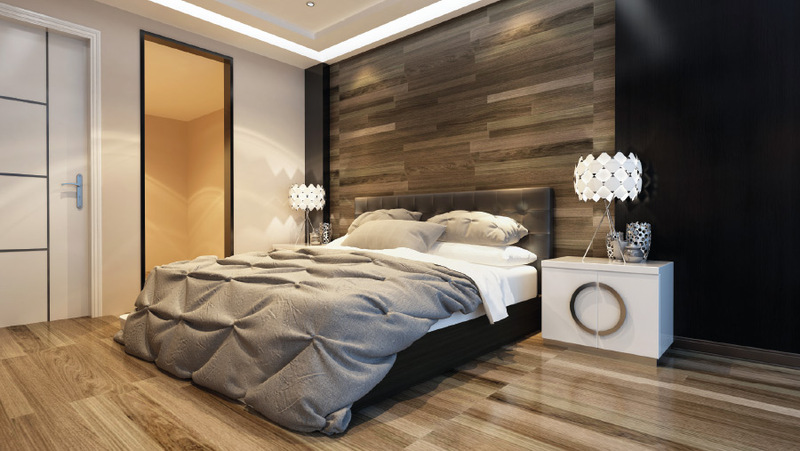 The headboard wall is a simple timber backing which complements the timber strip flooring. A rug is used to centralize the bed within the room, so the timber doesn’t dominate. The bed headboard cushion mimics the footstool, which is then carried over to the window seating to give this room design a generally balanced feel. The only quirk I would have personally is the size of the side lighting, which seems to be large and positioned too high above the bed. But then again, this is just a personal quirk. One of the more important rules we need to keep in mind is to maintain a sense of proportion and scale for the room. In this example, apart from the mirror in the room, the overall bed arrangement is near perfect. The general walls are painted in an off-white colour, but the feature wall is painted in a light brown tone to match the tone of the carpet flooring. 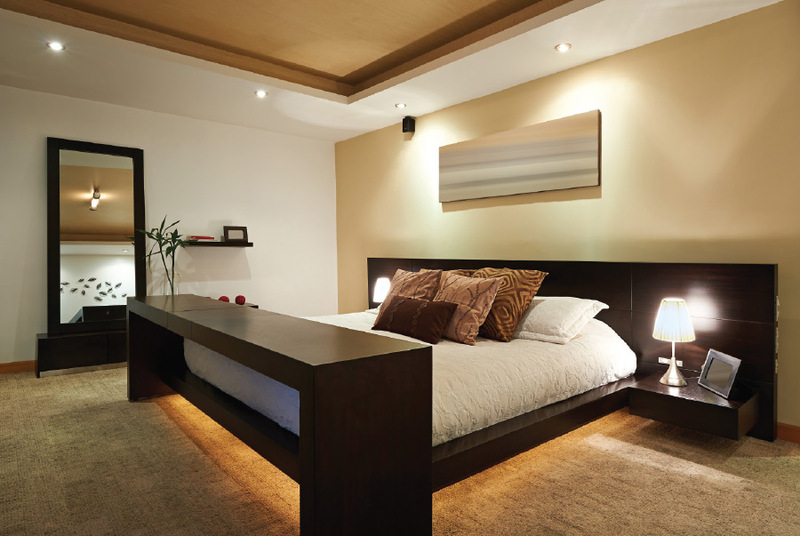 Since a carpet is used as the flooring material to create a distinction between the bed and the floor, the use of recessed lights works perfect to create the floating effect of the bed. The low walnut headboard works well as it doesn’t overwhelm the room and creates the perfect anchor to the bed. In terms of lighting, the use of recessed lights are perfect for general lighting as well as paintings, while the table lamps are proportionally chosen so they do not overwhelm the room. In these two examples, it helps to illustrate how proportion and position are key elements in the design. The first concept has all the properties of a bedroom design, but the headboard is far too narrow, which then creates a claustrophobic feel and puts the whole proportion of the room out of sequence. The next example looks at the small details, which may affect how we perceive the room. The slanted ceiling offers a great opportunity for natural sunlight to penetrate the room. The use of light timber tone flooring helps give prominence to the bed design, but the position of the bed could have been better justified by shifting it to the left to avoid being placed in the middle of where the ceiling is flat and slanted. While some of these features may not be obvious to the naked eye, it may end up being a quirk to some. 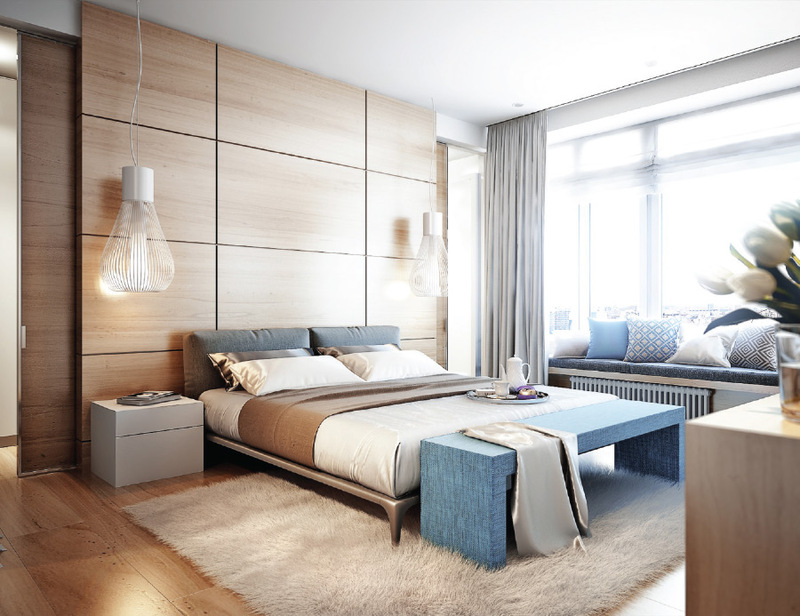 When we look at bedrooms designs, always keep the key elements in mind. The first is the setup of the room and how to proportionately locate the bed and other features. The next is to make sure all the elements of the bedroom are present – from the lighting, headboard, rugs, and balance of elements and colours. Finally, try to make sure you position your bed in a way that allows you to tap into one of your auspicious directions. Next articleGame Of Thrones: Will Fire Be Stronger Than Ice?